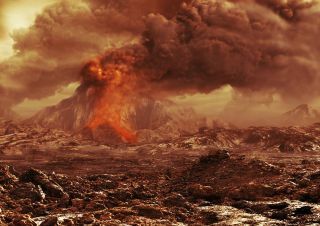 Artist’s concept of an active volcano on the planet Venus. Venus' volcanoes are likely still spewing out lava, a new study suggests. The European Space Agency's Venus Express spacecraft observed temperatures spiking by several hundred degrees Fahrenheit in some spots on the scorching-hot planet's surface. The hotspots ranged from 0.39 square miles (1 square kilometer) to 115 square miles (200 square km). A closer look at these regions showed that they were likely hot due to lava running across the Venus surface, scientists said. Scientists found the spots in a region called Ganiki Chasma, which is already known to be quite young in geological terms. The zone was previously examined by the Soviet Union's Venera spacecraft in the 1980s, and by NASA's Magellan mission in the 1990s. The rifts in Ganiki Chasma are probably created when the crust is stretched by internal pressure, forcing magma to the surface, researchers said. This same process has been observed on Earth. "We were able to show strong evidence that Venus is volcanically, and thus internally, active today," study co-author James Head, a geologist at Brown University, said in a statement. "This is a major finding that helps us understand the evolution of planets like our own." The new study was led by Eugene Shalygin and Wojciech Markiewicz, both of the Max Planck Institute in Germany. It was published online in the journal Geophysical Research Letters. Ganiki Chasma also was discussed in a presentation at the Lunar and Planetary Science Conference last year. That research, presented by Alexander Basilevski (a co-author on the new paper), revealed four hotspots in the region that stood out even in Venus' 800-degree-Fahrenheit (427 degrees Celsius) surface environment. Venus Express spent eight years orbiting Earth's "sister planet" before running out of fuel and falling into the atmosphere this past December. Through part of 2014, the spacecraft performed risky dives into the Venus atmosphere to gather more information about its composition. The goal of these maneuvers was, in part, to gather data that could aid the design of possible future landers.